I went to Europe for the first time in 1997. I was 18, coming off of a failed attempt at college and several months of double shifts in San Francisco restaurants trying to make enough money for a plane ticket. I carried around with me a haze of too much pot smoking, the weight of too many late-night night ham sandwiches, and a lot of the fear that can come from stepping outside of the plan. I had just change my name from my mother’s last name to my father’s (a family I had no connection with at all), so I had a new passport and license, and (I might have believed) a new identity. I went to Europe with the intention of moving there. I traveled mostly alone, sometimes with friends, always looking for the place I’d stay. I often slept on trains to avoid lodgings costs and I lived on bread and beer, which were always cheap and good and filling. There were some cities that took me in–an apartment and a job would materialize–but I’d inevitably cave while I was considering the offer. I started to dream of New England, and mostly the feeling that there was a place that had grown me like a tree, a place I had claim to. I’d get on another train and go to another city, and then I’d decide to leave again. And after I wandered long enough that my money was gone and I could only think of New England, I got on a plane and flew home to the Berkshires. I decided I was cut out to be a traveler, but not an expat. A few months ago in the frozen depths of mid-February, I got an email inviting me to Italy. I’ve had writer friends invited on these elusive press trips to California or Israel or anywhere, but I’ve never been invited and honestly I thought it was a mistake or some sort of spam. I know I’m breaking the code to admit this, but I have to tell you why I spent the next two weeks telling people that I was going to Italy with a “?” at the end of my statement, if only to infer a “I don’t know how, so don’t even ask.” The trip was paid for by the Italian Trade Commission, and I promised only that I would keep my eyes open and learn and try to eat as much as I could. 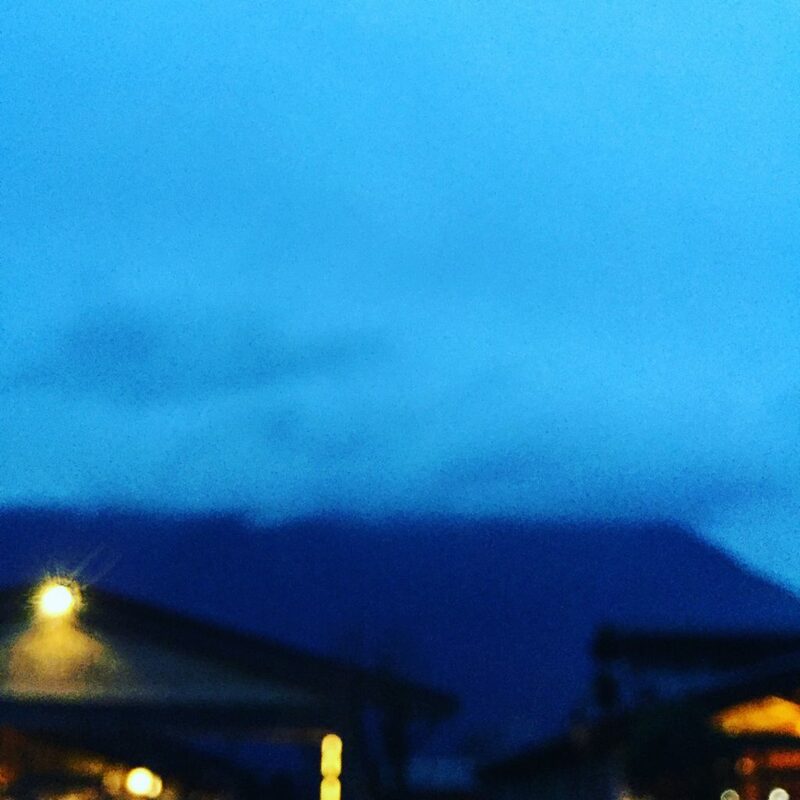 I didn’t know who would go–only that I’d be in Milan and in the mountains north of the city. I can only imagine that I was included based on my overwhelming enthusiasm for this day nearly a year earlier, and, in fact, I’d been recently dreaming of going back to Italy to specifically learn more about food certification in the country, most importantly DOP (or PDO, if you’re looking at a some labels in English), and I guess the universe answered in the form of an email. I left for Milan almost 20 years to the day from the time I went to Europe in 1997. And somehow again (and maybe every time), I stepped onto the plane as a separate person from who I’d been, maybe faking it a little, doing my best to play the part of the person I imagined should be stepping on the plane. It turned out we were 8 people in total–some food writers, some magazine people, one newspaper journalist. Our first two days were in Milan, but then we drove into the mountains into a region called the Valtellina Valley, and that’s the part I most want to tell you about. First, a bit on DOP certification. Think about the labels you look for on products at the grocery store. We don’t have many that really mean much here, think about the “Certified Organic” label or the non-GMO butterfly, and start there. Those are probably the closest thing we have in the US to the EU’s DOP certification. DOP translates to Protected Designation of Origin, and this means that the product was overseen from its very beginnings all the way through its packaging. You know exactly where it comes from and how it was made, because every step is strictly regimented. And the rules of each product’s DOP certification, as far as I’ve come to understand it, specifically relate to the unique product itself. Instead of starting with a list of standards (like organic certification), the EU starts with the traditional method and region of a product, and protects that process, laying it out into a list of standards so that no one can fake the product and call it by the same name. You might have DOP balsamic vinegar, Parmigiano Regianno, prosciutto, olive oil, or canned tomatoes, but each of these have different standards specific to the product, all crafted around the way the product has been made for centuries.. But what it means across the board is that every moment of the product’s process–whether we’re referring to the milking of the cow or the raising of the pig or or the growing of the tomato or the bottling of the olive oil–happened locally, all according to the incredibly high standards of the certification. It’s a guarantee of quality, safety, and of a product made according to the tradition that created it. We really have no equivalent to the DOP label here in the US. 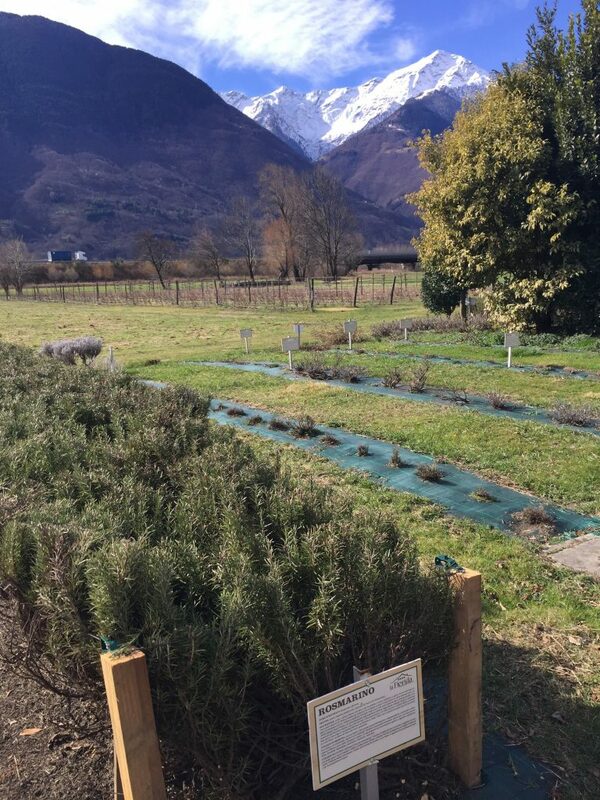 We went to the Valtellina Valley to learn about a few specific DOP foods–Bitto and Casera cheese, as well as Nino Negri Wines (these are DOCG and DOC- two of the similar certifications specific to Italian wine). 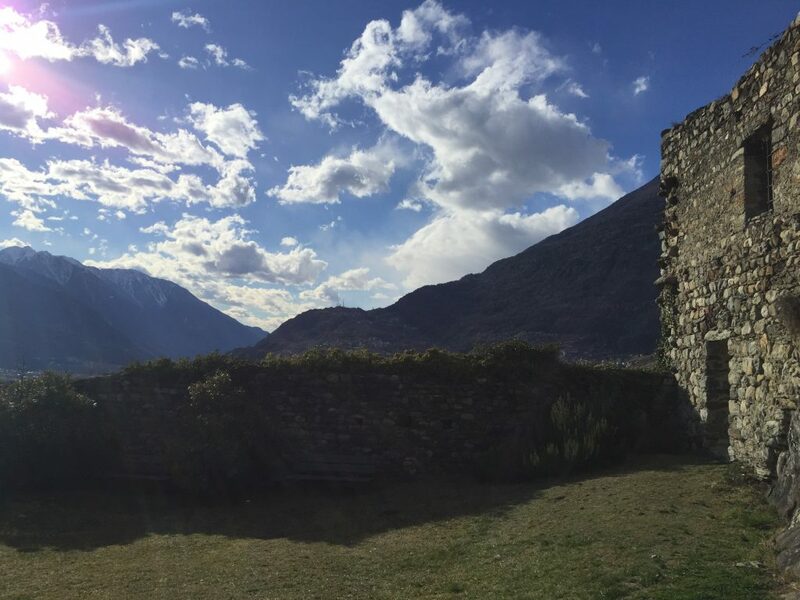 I think we were brought to Valtellina with the hopes that we could help bring attention to a region that gets less love than the more touristy parts of the country. Allow me to do my part here, which I think I can do better with images than with words. 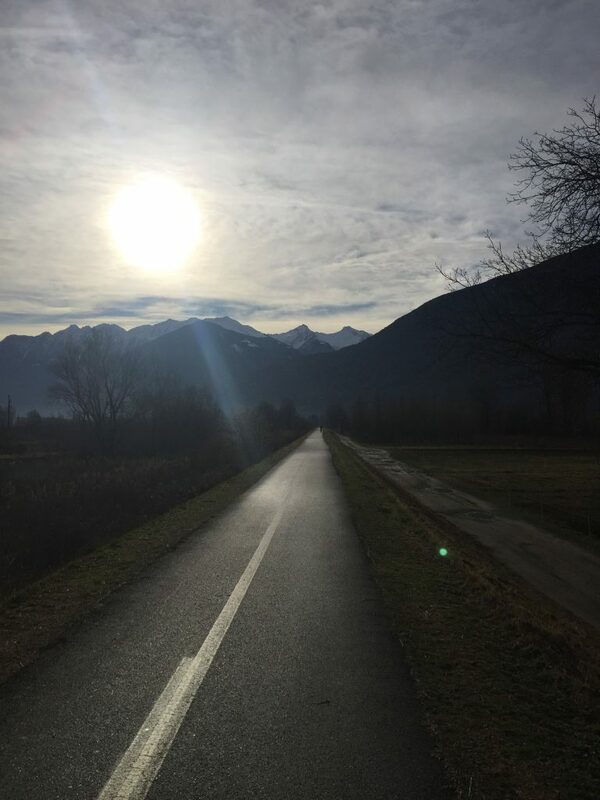 I remember past experiences more when I travel, maybe because I’m outside of my life, or maybe because I have the space to do it, but in Valtellina I found myself thinking a lot about that trip I took 20 years ago. I wasn’t looking for a home this time, but there was something in that little region that reminded me of the Berkshires (tiny mountains as they are). There was a way that the region was struggling, trying to hold on to itself and its traditions, that felt familiar to me. I was thinking a lot about the different ways I’ve come to places in my life, and how I try, if I can, not to insert myself in as I tried so hard to then, but to know that I’m on the outside. We spent a morning at La Fiorida agrotourismo with one of the cheese makers who walked us through the start of the making of Bitto. She did this not in their cheese making facility but in a little hut build for educational purposes, there to demonstrate the way the cheese has been made for centuries. 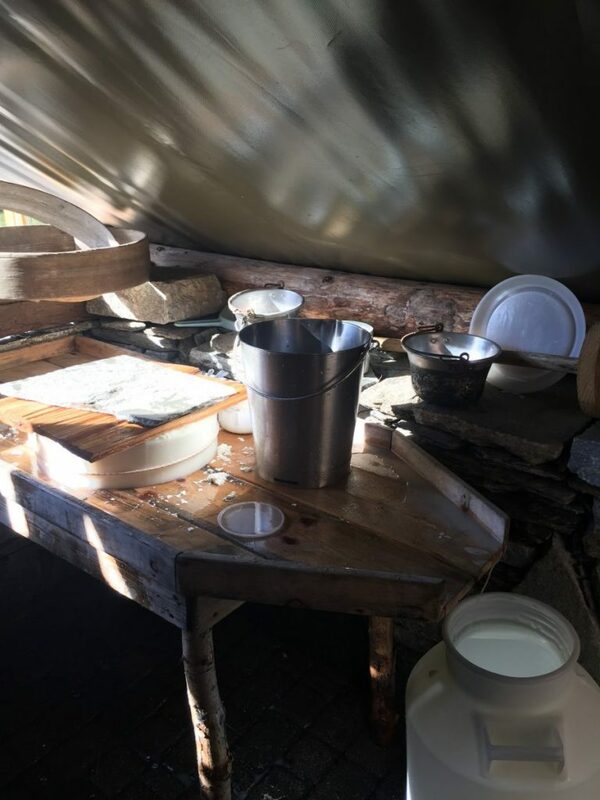 She followed the same basic process I do in my cheese making classes–heat the milk, add rennet, break up the curd–and the fresh curds she scooped out for us were sweet and a little salty. 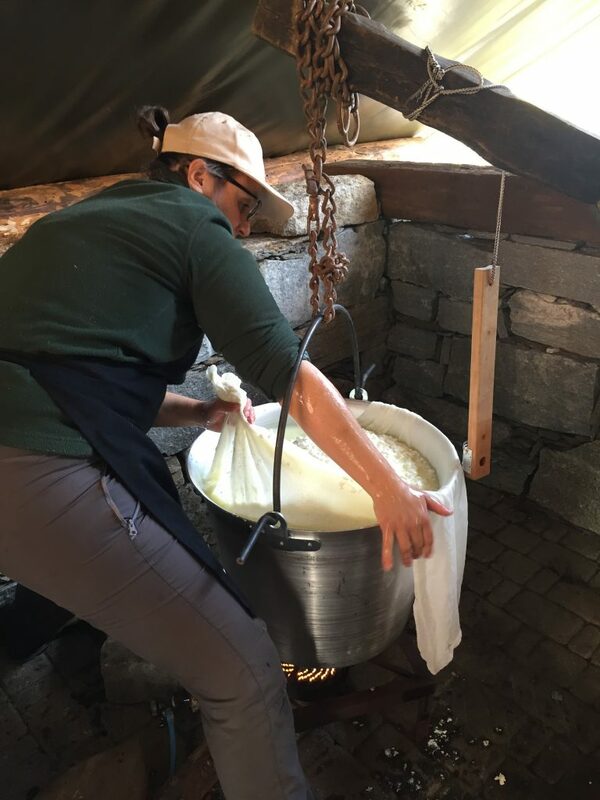 The flavor was different that that of the cheese I make, and I felt lucky to understand the process in a way that helped me to know that the flavor of those curds had very little to do with any cheese making magic she was working. 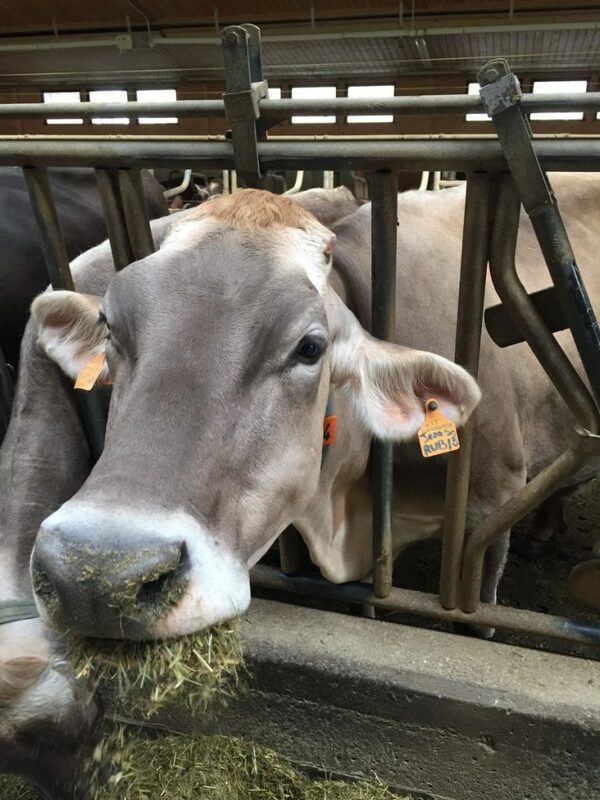 That flavor was all about the cows themselves, and the grass they ate the water they drank and maybe even the air they breathed. It gave me a new perspective on this idea of DPO, that is, Protected Designation of Origin, in that each of these foods- the cheese, the vinegar, the tomatoes–any of them, each fully represent or even embody the actual place that created them. And when a food is so purely from a place and a tradition, it tastes of that place. There’s something in the DOP conversation that feels like a clue to understanding how we relate to food and quality in the US–I felt that last year when Sadie and I went to Bologna, and I got so much more of that on this trip. I’m hoping to study this more. If you have thoughts, or just stories about Italian food you want to share, yes, yes, yes. 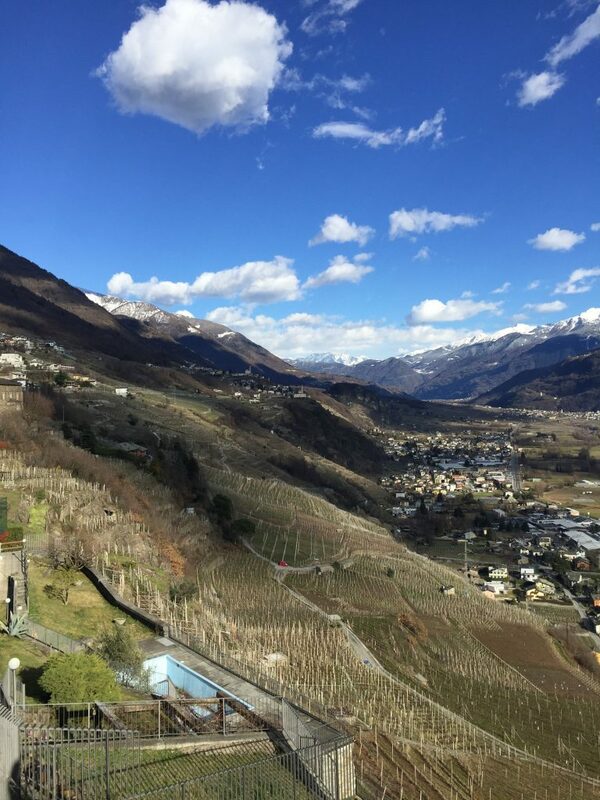 Or if you’re looking for a place to go, can I recommend the Valtellina Valley in Lombardy? The mountains are high, the rivers are clear, and the cheese tastes like grass and sun. I loved, loved, loved this post. Thank you ever so much! As well, I have both your books and use them ALL THE TIME! Thank you for blogging and writing. What a beautiful and nourishing post. I love it when people, places and things know they are a physical extension of Source energy, whatever that might mean for you. When cheese tastes like sun and grass, it helps me remember all things remain forever possible. Thanks for sharing your experience with us, Vaya Con Dios! Ahhh Nice to have you back! i have a love hate relationship with the labels that exist here in Europe. I hate that fact that they should even need to exist and I’m so thankfull that they do exist, mainly to ensure city dwellers products of quality. I must underline one fact, though traditions are protected there is VERY little space for creativity. No lavender or horseradish cheader over here! 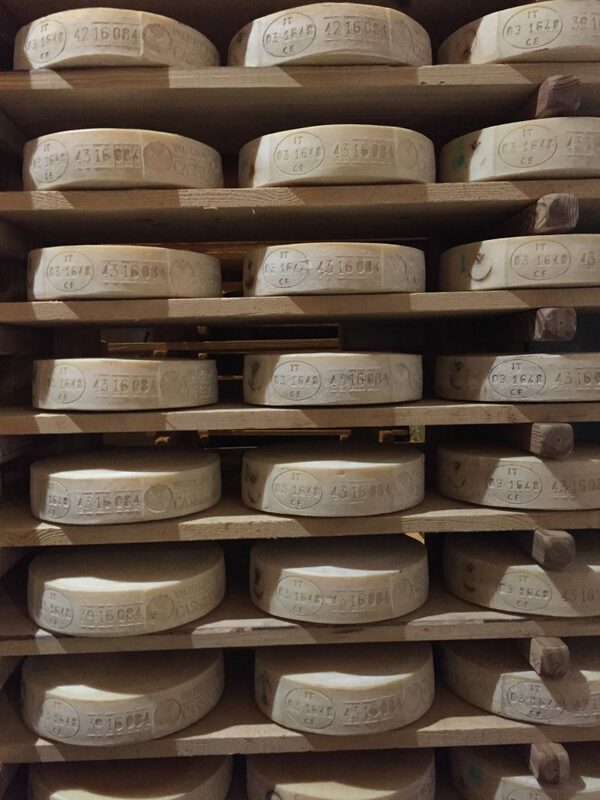 I recently was talking about a sheep cheese with my cheese monger he said it was one of the reasons he loved his job; it is made during a very specific period of the year when they are moving the sheep to higher grounds, the milking and the whole process is done by hand, only 130 cheeses are made per year. Let me tell you that cheese definetly tasted like a walk up the mountain! Oh- it’s so good to hear about the challenges of actually living with these labels! Always good to know that there’s another side. But here in the US- there’s just so little transparency about how our food is created. I think a system in this direction would do wonders for us. What an amazing opportunity! The DOP certification sounds like a good system for everyone, from the farmers to the food manufacturers to the consumer. Very important! How fascinating. I wish we did have better labels and oversight to food here in the US. I love the importance placed on food in Europe because I love to eat good food, and I wish there was less bad/cheap/factory food in the world because I am sure people would love good food and buy good food. Amazing! Just amazing, nothing to say. I love your blog! Two sites I can’t afford to read their content in two days – this site and another by the Kitchen Witch Maven. you guys have been a blessing to my kitchen life as a mother. And I must say, this is another great post here – really inspiring and eye-opening, especially the DOP. It’s a great one!